That video was a great demo of the amp’s capabilities, but I really dig this one done by Alex Hutchings at Musikmesse 2009. He’s a great player! The Cube series amps have been known for their versatility. They sound great a pretty much any volume level, and they have enough features packed into them to make it easy to just pack the amp, a guitar and go. I have a couple of friends who use Cubes for club gigs! There are a few of standout features that really pique my interest: 1. The ability to hook up an MP3 player to the amp to practice with; 2) The looper function, and finally; 3) The built-in chromatic tuner. This amp is made for gigging, and with the line out, you can go right into a board – which I’ve done many times with my Cube 60. If you’re looking for a great, versatile amp, you can’t go wrong with a Cube. Just pick the one that suits the volume level you need (or the features you want), and you’re good to go! 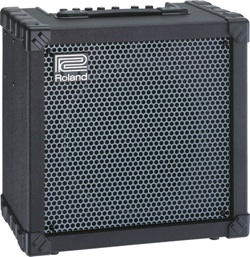 For more information, visit the Roland Web Site!